This isn't the first instance of vandalism at the memorial. camera (National Park Service) Graffiti on a column of the Lincoln Memorial, discovered early in the morning, August 15, 2017. 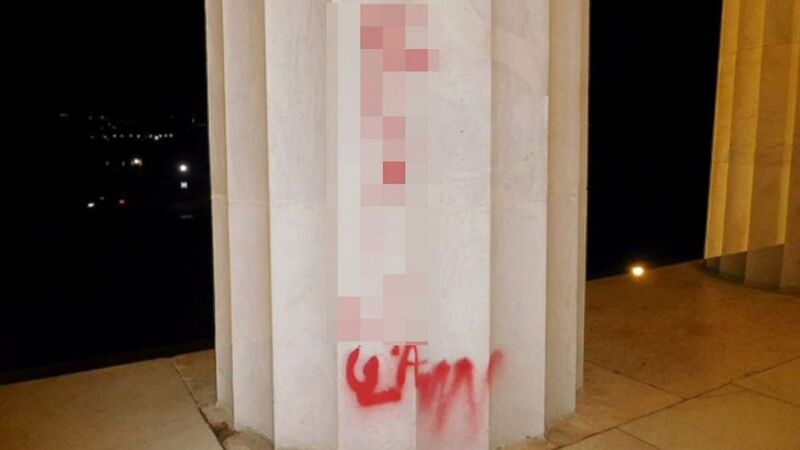 The Lincoln Memorial was vandalized with bright-red graffiti early Tuesday morning at around 4.30 a.m.
Officials with the National Park Service (NPS) said the red spray paint appears to state “[expletive] law” on one of the memorial’s columns overlooking the National Mall. Another instance in silver spray paint was also discovered on a Smithsonian wayfinding sign in the 1400 block of Constitution Avenue. Work to remove the graffiti is already underway using a mild, gel-type architectural paint stripper, according to the NPS. The gel won’t affect the preservation of the memorial’s historic stone. This isn’t the first instance of vandalism on the Lincoln Memorial or other national monuments. In July 2013, the giant statue of the 16th president was splashed with green paint on the left pant leg. The Washington Post reported that this was the first incident of vandalism on the monument since its dedication in 1922. More recently, over the President's Day weekend in February 2017, the Lincoln Memorial, Washington Monument and World War II Memorial, three of D.C.’s most popular monuments, were vandalized with marker pen. Local ABC affiliate WJLA reported that the graffiti included small phrases that appeared to be conspiracy theories, such as "Jackie shot JFK," "blood test is a lie, leukemia, cancer HIV get 2nd opinion" and "9/11/01 Misty pilots fly planes into WTC 1, 2, P, F."
The World War II Memorial’s North Dakota column was also defaced with spray paint in November 2016, in what was believed to be a sign of protest against the Dakota Access Pipeline, according to The Washington Post. The United States Park Police has asked anyone with information to contact the agency at 202-610-7515.